Now you can show your friends what kind of trees you like by wearing this bonsai tree t-shirt. You can get this t-shirt in many sizes and in styles for men, women, and kids and it comes in many colors too. 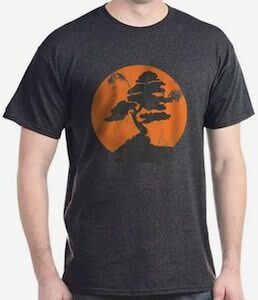 On the shirt you can see a big orange circle that maybe is the sun setting and in that circle you can see a silhouette of a bonsai tree and that really look pretty cool in that orange circle. So if you like little trees, Japan, or just cool shirts then you should take a closer look at this.